From our starting point we followed the Pennine Way up Jacob’s Ladder and until the footpath veered north. From here our route took us south then west along the paved moorland path until we reached South Head. 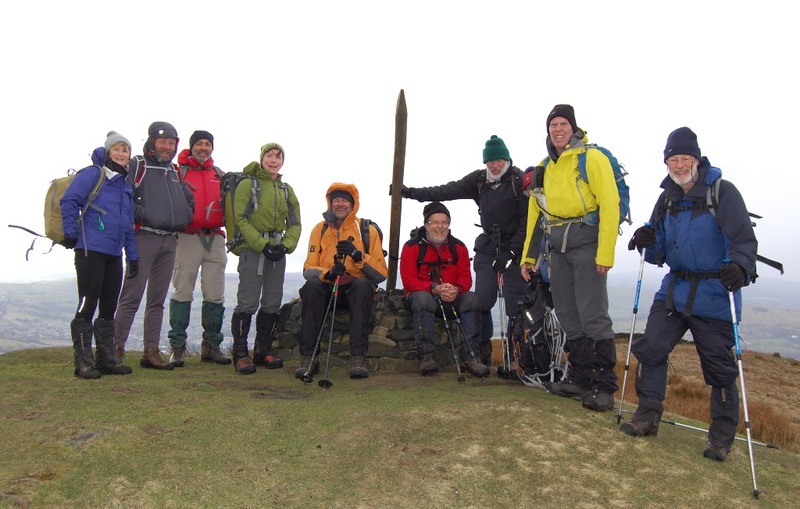 The day was brightening, although in the cold wind we only lingered long enough for a summit photograph and to take in the views out towards Cheshire and the nearer edge of Kinder Scout, our return route for the afternoon. A short descent and a gradual climb brought us to the delightful ridge of Mount Famine. At this point the rain arrived, but the summit rocks provided shelter for a coffee break and the opportunity to don waterproofs. On emerging back onto the ridge we were greeted with sunshine and blue sky. It was going to be one of those days. We paused in our descent to admire the views into the Sett Valley below us, and the plume of wind blown water from Kinder Downfall was clearly visible. Farm tracks led us through the hamlets of Hill Houses and Farlands before we skirted the wall of Kinder Reservoir. We dined in the sunshine overlooking the water. Once past the reservoir we began the long steep climb to meet the Pennine Way along the edge of Kinder. On turning to admire the view we realised that the ominous black clouds over Manchester were quickly heading in our direction which led to a frantic scrabble for waterproofs. A loud roll of thunder heralded a heavy shower of hail and we gradually made our way to the Downfall with snow flurries, rain and low cloud to accompany us. Continuing along the edge we reached the trig point on Kinder Low and then descended to Jacob’s Ladder, with the Edale Valley in view below. As we reached the cars, the rain arrived again. Our party of 11 enjoyed a good Easter Sunday walk of 14.3 miles.